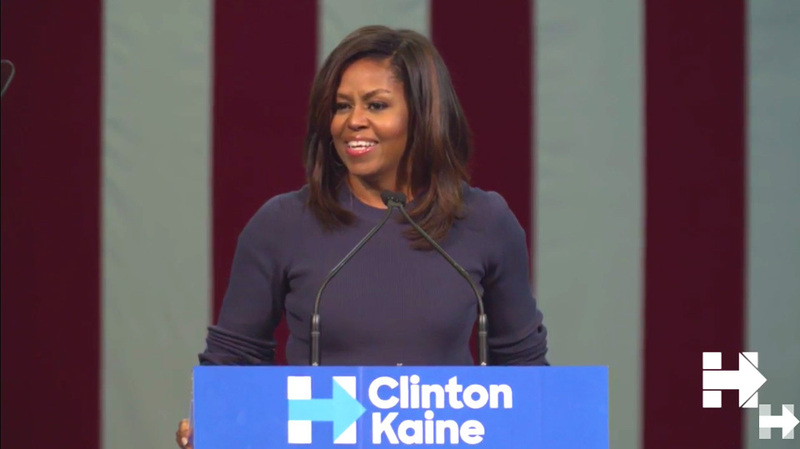 Michelle Obama spoke Thursday in New Hampshire (an important swing state) supporting Hillary Clinton’s candidacy for president and thoroughly denouncing Republican candidate Donald Trump. And yes we keep saying this, but this speech just might be the first lady’s best yet. Obama isn’t usually spotted on the campaign trail; she’s the Democratic ticket’s secret weapon, only employed in the case of an emergency. And New Hampshire has the potential to be an emergency. During her speech, Obama explained how close the numbers were during the 2012 election. Many are suggesting this speech is one for the history books, and it is. This speech transcends politics and questions our collective morality. She starts speaking at 25:10. The first lady was visibly horrified by Trump’s comments and alleged behavior. She implored the audience to simply imagine the consequences of a Trump presidency and the effect it would have on our children. Toward the end of her speech, she urged the New Hampshire audience and those of us watching to vote for Hillary Clinton. People on Twitter are in a frenzy after hearing Obama’s speech, and we’re right there with them. We were so lucky to have Michelle Obama as our First Lady, but today she was more like our national conscience. Thank you @FLOTUS. Michelle Obama is hitting Eleanor Roosevelt levels of greatness.